Avianca adds four new weekly flights on the Bogotá-Madrid-Bogotá route, making a total of 14 flight services per week on the route. The Carrier now offers travelers 25 flights per week between Colombia and Spain, making it the leader in connectivity options to strategic points in the European country. The new flights are already available in the booking systems, travel agencies and at the Airline's sales points. 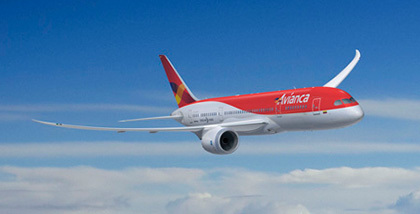 Avianca announces more flights on the Bogotá-Madrid-Bogotá route starting May 16, 2013. The Carrier now offers two daily scheduled flights between the two capitals, giving travelers two new options and new flight times. The increase in flight services further consolidates Avianca as the airline with the greatest number of non-stop flights between Colombia and Spain. It flies direct from Bogotá to: Madrid (two flights per day) and Barcelona (four times per week); from Cali to Madrid (five times a week) and from Medellín to Madrid (2 flights per week). The Airline hereby confirms its commitment to the Spanish market and demonstrates its decision to make the Hub in Bogotá its main connection center for destinations outside Latin America. Thanks to agreements with other airlines Avianca also offers travelers from Latin America flights from Madrid and Barcelona to the main capitals of Europe. It has now added trains to these air connections. Following the intermodal agreement signed with the Spanish railroad operator Renfe, Avianca passengers can combine plane and train journeys in a single ticket and enjoy a new travel option. All Avianca flights between Colombia and Spain are operated by modern Airbus A330 aircraft with Business and Economy Class cabins. Passengers can enjoy an exclusive in-flight entertainment system that includes individual screens in both classes, giving passengers a variety of ways to have fun, rest or work as they fly to their destinations. *Starting May 16. Until then they will only operate only 3 days/week. AV026: Tuesday, Thursday and Saturday. AV027: Wednesday, Friday and Sunday. Information, flight schedules and tourism packages are available at Avianca sales points, in your favorite travel agency, in the Call Center on 018000-95 3434 or in the webpage www.avianca.com. In Spain you can call 902 026 655.